Eoin O’Duffy was born in Ulster, near Castleblaney in county Monaghan. Trained initially as an engineer he later became an auctioneer. He became interested in Irish politics and joined Sinn Féin, later becoming a member of the Irish Republican Army (IRA). During the War of Independence, O’ Duffy commanded the Monaghan Brigade and in February 1920 he successfully captured the RIC barracks at Ballytrain taking from it weapons and explosives. Also present at this victory were Ernie O’ Malley who went on to organise flying columns and the socialist guerrilla fighter Peadar O’ Donnell. In the general election of 1921 he became TD for Monaghan. By 1922, O’ Duffy had been promoted to Chief of Staff of the IRA and was one of Michael Collins foremost supporters when he accepted the Anglo-Irish Treaty and fought in the civil war as a general of the Free State Army. As commander of the 2nd Northern Division of the IRA he saw action in Belfast when defending Catholic ghettoes from attacks by Protestant pogramists. He was also to lead the Free State forces into Limerick city. In September 1922, following the mutiny in Kildare by Civic Guard recruits, O’Duffy replaced Michael Staines as commissioner. Under O’Duffy the police force was renamed the Garda Síochána, disarmed and was later merged with the CID and the Dublin City Metropolitan Constabulary. O’ Duffy’s fervent Catholicism was greatly reflected in the ethos of the Garda Síochána. 1933, O’ Duffy became associated with Cumann na nGaidheal by taking on the leadership of their security organisation The Army Comrades Association, later to be known colloquially as the Blueshirts. This organisation was to become a participant in many street brawls with anti-treaty sympathisers who had tried to breakup pro-treaty political meetings. When the pro-treaty parties merged in 1933 to become Fine Gael, O’Duffy was the party President for a short period of time. 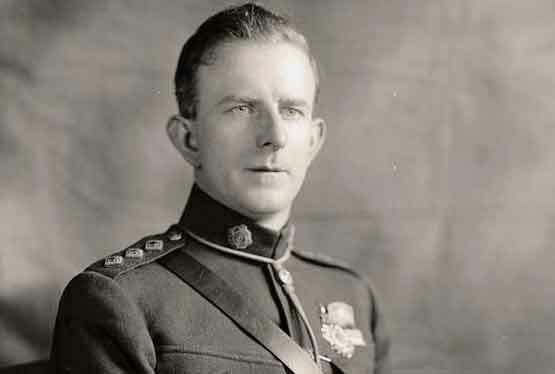 It is now believed that he had encouraged (unsuccessfully) William Cosgrave to consider a coup-de’etat in the event of Fianna Fáil winning the general election of 1932. Cosgrave, in the event, put his trust in democracy when Fianna Fáil did in fact form a government, led by Eamon de Valera, with the help of the Labour Party. After the 1933 general election, which again saw de Valera in power, Eoin O’Duffy was dismissed from his post as Garda Commissioner on the grounds that due to his past political affiliations, he would be unable to carry out his duties without bias. In Europe the new phenomenon of fascism was gaining ground and O’Duffy like many of his pro-treaty colleagues, was drawn to it. His Army Comrades Association was renamed the National Guard and they began to take on many of the symbols of fascism such as the out-stretch arm salute and the blue uniforms. When O’Duffy planned a massed march for August 1933 in Dublin to commemorate the deaths of Arthur Griffiths and Michael Collins, de Valera, fearing a coup, had it banned. Possibly de Valera was also testing the loyalty of the army and the Garda Síochána. In September the National Guard itself was banned although it reformed under the title The League of Youth. In 1934 O’Duffy suddenly and inexplicably resigned as president of Fine Gael although it is known that many of its members were growing worried by his actions and statements. The Blueshirt movement began to unravel at the seams. That same year he formed his own fascist movement, The National Corporate Party. In 1936, supported by the Irish Catholic Church, General O’Duffy led 700 of his followers to Spain to help General Franco in his war against the republican government. They formed part of the XV Bandera Irlandesa del Terico a part of the Spanish Foreign Legion. The Bandera saw little or no action and were returned to Ireland in 1937. Although O’Duffy had some low level dalliance with the Nazis he never did regain any of his political influence. His health was on the decline and 30 November 1944 he passed away. De Valera granted him a state funeral and he was interred in Glasnevin Cemetery. A History of Ireland in 250 Episodes by Jonathan Bardon. Gill & Macmillan. Dublin. 2009 edition. Eoin O’Duffy Biography by John Simkin (Web Archive). Eoin O Duffy, A Self-Made Hero by Fearghal McGarry.Oxford University Press. Oxford.2005.